Teaching open mindedness and willingness to see others' points of view is not something that can be tackled head on. It is rarely effective to exhort students to see other points of view because 'it's the right thing to do.' (In fact, this approach is likely to be equally ineffective for adults too.) Stories are more effective in this situation. Stories allow the reader to be an observer to a dilemma or situation-- to see it from a 'disinterested' point of view and therefore be more able to see how the characters could benefit from being more open minded, from listening to each other rather than insisting on their own point of view. Hopefully the books listed below will assist you in teaching open mindedness in your own classroom. It is certainly an attribute that, once instilled, will help bring about more peace in the world! Two voices debate the identity of the creature shown. 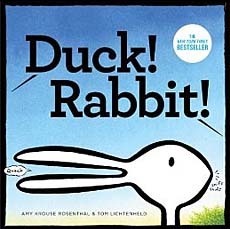 One thinks it's a duck, the other a rabbit. When the debaters start to see each other's perspective, a new ambiguous 'combination creature' appears. The "right" answer is never given, and your class/children will likely have differing opinions, making this is a great discussion starter for talking about how two people can think differently about something, and both be right. Six blind men travel to the palace of the prince to meet his new elephant. 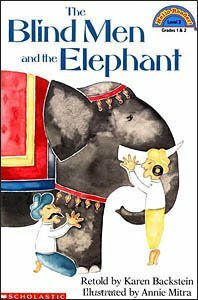 Each man touches a different part of the elephant and then describes what the elephant is like, a wall, a snake, etc. This fable from India shows that a person cannot always rely on their limited understanding of something. Four seemingly unrelated stories are told and continued on each two-page spread, but a fifth story is created through the interaction of the four stories, and that fifth story becomes a surrealistic tale with several levels of reality. In fact, it begins to be seen as a puzzle or game (ie: are characters in one story riding on the train in another?) Answers are never given. The reader must take all points of view into account to get the whole story here. 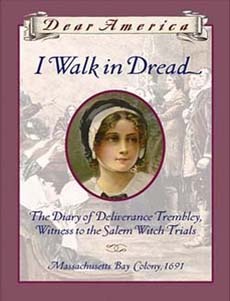 Set during the Salem Witch Trials, I Walk in Dread is the journal of Deliverance Trembley, who at first believes the local girls who are accusing others of being witches, but then begins to have doubts when a trusted neighbor is accused. She eventually changes her mind about those who have been accused, which shows how a person's view about something can (and sometimes should!) change over time and with new information. 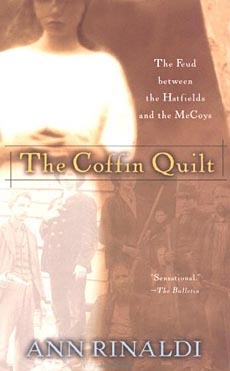 Based on a true story, The Coffin Quilt tells about the decade long feud between two families in the West Virginia/ Kentucky back country. 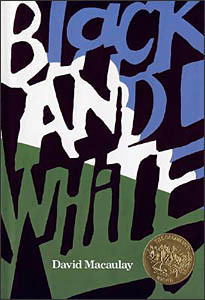 Narrator Fanny McCoy, 16, lives in the shadow of the feud and as tensions rise and violence escalates, she realizes that she is powerless to stop the fighting and must learn to rise above it to find her own way out of the hatred. 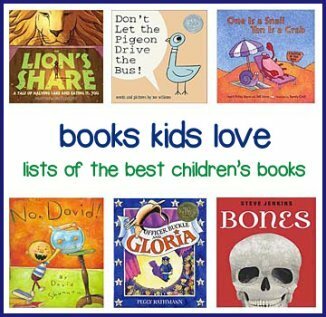 We'd love to list more books on this topic---books that help teach children to be open minded and willing to see things from other points of view. Do you know of a great children's book for teaching open mindedness? If so, let us know by completing the Suggest a Book form (top right column).